Thanks to the Williams Outing Club partnering with BATS, we are able to host the Backcountry Film Festival again this coming year! Parking: Parking Garage off of Route 7/North Street, off of Mission Park Drive, or other public parking areas. Refer to the Interactive Campus Map online here, or use Google Maps Link. Join us for an evening of celebrating winter human powered experiences, complete with mingling opportunities, a raffle or two, and stoke! Get ready to get goosebumps while you “Ooh!” and “Ahh!” at the impact and importance of our winter wildlands through this collection of short films. 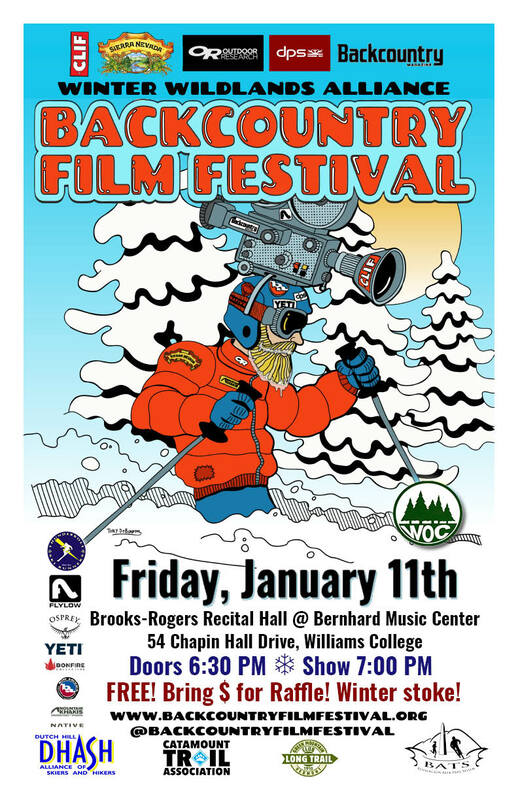 The 14th annual Winter Wildlands Alliance Backcountry Film Festival is hosted in partnership by the Williams Outing Club and the Bennington Area Trail System. Non-profit groups that will be present with information include: Bennington Area Trail System, Catamount Trail Association, Dutch Hill Alliance of Skiers and Hikers, Green Mountain Club Bennington Section, and Thunderbolt Ski Runners. Other local outdoor businesses and community health organizations will be on-site with information about their offerings as well. There will be a raffle and/or 50/50 with proceeds going toward several of the organizations present. Questions, email batsvt@gmail.com or alm5@williams.edu.